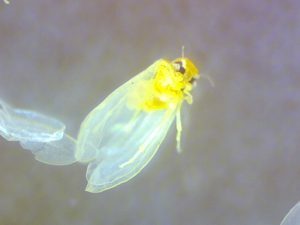 Whiteflies on Cranberries – How Much Should I Care? Cranberry growers have faced a few challenges lately with “new” insect pests. I call them “new” because they have been around for many years but not in numbers high enough to cause any economic damage in commercial beds. This situation changed in the past few years when toad bugs and a mirid (both native to New Jersey) appeared in high numbers in a few cranberry farms in New Jersey. Since then, my message to cranberry growers has been to become more vigilant when scouting for insects. Being more vigilant comes with a price- you will start to see more “things” and become more concerned on whether what you see can be pests (i.e. reduce your yield). For instance, we have commonly seen thrips, whiteflies, and aphids in cranberry beds, sometimes in very high numbers. However, these insects have NEVER been reported as serious pests of cranberries. This doesn’t mean we should ignore them but simply not to be too concerned (lose sleep over them) at the moment. Since I joined Rutgers U., we have been scouting several beds for insects both detrimental and beneficial using different methods including sweep nets, sticky cards, and visual counts. We have commonly observed thrips and whiteflies in our yellow sticky cards. Despite being in high numbers, we have never seen a decrease in yield due to these insects. Recently, a grower reported high whitefly (adult) populations in his farm. Adult whiteflies are very small, whitish insects (white wings, yellow body; see picture); hard to see with the naked eye. Most species are polyphagous, meaning that they feed on several hosts. They have sucking mouthparts that allow them to feed on the plants’ juices (phloem). Whiteflies are most important for the transmission of diseases in plants but this is not the case in cranberries- no viruses have been linked to whiteflies in cranberries. They can also weaken plants by their direct feeding. Most cranberry growers likely had them in their farms for decades; yet, we have never seen any indication that they cause any damage to the vines or reduce yield. Interestingly, in a sweep net sample from late May, we observed high numbers of adult whiteflies but very few nymphs (immatures). This may indicate that adults are migrating from hosts other than cranberries; whether they overwinter in cranberries is unknown. We have collected adult whiteflies and will be sending specimens for identification. We will also conduct studies in the future to correlate whitefly numbers with yield. At this point, however, my message to growers is continue to be vigilant but not to be too concerned about whiteflies on cranberries.